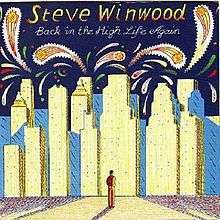 "Back in the High Life Again"
(1986) "Back in the High Life Again"
"Back in the High Life Again" is a 1986 single written by Steve Winwood and Will Jennings and performed by Winwood. The single was included on his album Back in the High Life and included backing vocals by James Taylor as well as a prominent mandolin played by Winwood. "Back in the High Life Again" was Winwood's second number one on the Adult Contemporary chart. The single stayed at number one for three weeks and went to number 13 on the Billboard Hot 100. The song was in closing credits of the CBS Sports coverage of the NBA Finals in 1987, and appeared in the It's Always Sunny in Philadelphia episode "The Gang Buys a Boat". It was also used in a photo montage of the NASCAR on TNN production crew after TNN's final NASCAR race broadcast, the 2000 Checker Auto Parts/Dura Lube 500 at Phoenix International Raceway. Warren Zevon subsequently covered the song on his 2000 album Life'll Kill Ya. ↑ Whitburn, Joel (2002). Top Adult Contemporary: 1961–2001. Record Research. p. 262.